Maven’s slow progress towards becoming the most accepted Java build tool seems to continue, although a lot of people are still annoyed enough with its numerous warts to prefer Ant or something else. My personal opinion is that Maven is the best build solution for Java programs that is out there, and as somebody said – I’ve been trying to find the quote, but I can’t seem to locate it – when an Ant build is complicated, you blame yourself for writing a bad build.xml, but when it is hard to get Maven to behave, you blame Maven. With Ant, you program it, so any problems are clearly due to a poorly structured program. With Maven you don’t tell it how to do things, you try to tell it what should be done, so any problems feel like the fault of the tool. The thing is, though, that Maven tries to take much more responsibility for some of the issues that lead to complex build scripts than something like Ant does. I’ve certainly spent a lot of time cursing poorly written build scripts for Ant and other tools, and I’ve also spent a lot of time cursing Maven when it doesn’t do what I want it to. But the latter time is decreasing as Maven keeps improving as a build tool. There’s been lots of attempts to create other tools that are supposed to make builds easier than Maven, but from what I have seen, nothing has yet really succeeded to provide a clearly better option (I’ve looked at Buildr and Raven, for instance). I think the truth is simply that the build process for a large system is a complex problem to solve, so one cannot expect it to be free of hassles. Maven is the best tool out there for the moment, but will surely be replaced by something better at some point. So, using Maven isn’t going to be problem-free. But it can help with a lot of things, particularly in the context of sharing code between multiple teams. The obvious thing it helps with is the single benefit that most people agree that Maven has – its way of managing dependencies and the massive repository infrastructure and dependency database that is just available out there. On top of that, building Maven projects in Hudson is dead easy, and there’s a whole slew of really nice tools that come with Maven plugins that you can use that enable you to get all kinds of reports and metadata about your code. My current favourite is Sonar, which is great if you want to keep track of how your code base evolves from some kind of aggregated perspective. Use Nexus as an internal repository for build artifacts. Use the Maven Release plugin to create releases of internal artifacts. Create a shared POM for the whole code base where you can define shared settings for your builds. The setup includes a Git server (because you use Git) for source control, a Hudson server (or set of) that does continuous integration, a Nexus-managed artifact repository and a developer machine. The Nexus server has three repositories in it: internal releases, internal snapshots and a cache of external repositories. The latter is only there as a performance improvement. The other two are the way that you distribute Maven artifacts within your organisation. When a Maven build runs on the Hudson or developer machines, Maven will use artifacts from the local repository on the machine – by default located in a folder under the user’s home directory. If a released version of an artifact isn’t present in the local repository, it will be downloaded from Nexus, and snapshot versions will periodically be refreshed, even if present locally. In the example setup, new snapshots are typically deployed to the Nexus repository by the Hudson server, and released versions are typically deployed by the developer producing the release. 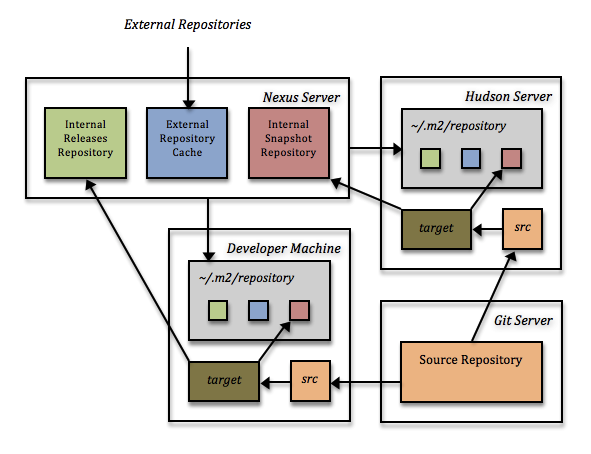 Note that both Hudson and developers are likely to install snapshots to the local repository. I’ve tried a couple of other repository managers (Archiva, Artifactory and Maven-Proxy), but Nexus has been by a pretty wide margin the best – robust, easy to use and easy to understand. It’s been a year or two since I looked at the other ones, so they may have improved since. There is interference between the two branches because they both create updates to the same artifact in the Maven repositories. Depending on the ordering of these updates, builds may succeed or fail seemingly at random. At Shopzilla, we typically solve this problem in two ways: for some shared projects, where we have long-lived/permanent team-specific branches, the team name is included in the version number of the artifact, and for short-lived user story branches, the story ID is included in the version number. So if I need to create a branch off of version 2.3-SNAPSHOT for story S3765, I’ll typically label the branch S3765 and change the version of the Maven artifact to 2.3-S3765-SNAPSHOT. The Maven release plugin has a command that simplifies branching, but for whatever reason, I never seem to use it. Either way, being careful about managing branches and Maven versions is necessary. A situation where I do use the maven release plugin a lot is when making releases of shared libraries. I advocate a workflow where you make a new release of your top-level project every time you make a live update, and because you want to make live updates frequently and you use scrum, that means a new Maven release with every iteration. To make a Maven release of a project, you have to eliminate all snapshot dependencies – this is a necessary requirement for immutability – so releasing the top level project means make release versions of all its updated dependencies. Doing this frequently reduces the risk of interference between teams by shortening the ‘checkout, modify, checkin’ cycle. See the pom file example below for some hands-on pom.xml settings that are needed to enable using the release plugin. release plugin is to specify the scm/developerConnection element. you want to share between all projects. to the binary that has been linked. the source is always up to date. is needed - I haven't tested that since maybe March 2009.
performance improvement for your builds. The less pleasant part of using Maven is that you’ll need to learn more about Maven’s internals than you’d probably like, and you’ll most likely stop trying to fix your builds not when you’ve understood the problem and solved it in the way you know is correct, but when you’ve arrived at a configuration that works through trial and error (as you can see from my comments in the example pom.xml above). The benefits you’ll get in terms of simplifying the management of build artifacts across teams and actually also simplifying the builds themselves outweigh the costs of the occasional hiccup, though. A typical top-level project at Shopzilla links in around 70 internal artifacts through various transitive dependencies – managing that number of dependencies is not easy unless you have a good tool to support you, and dependency management is where Maven shines. This entry was posted on May 1, 2010, 19:12 and is filed under Code Management. You can follow any responses to this entry through RSS 2.0. You can leave a response, or trackback from your own site. One of the nice things about maven as a build tool is that it’s been around a long time. This means it’s built up tools that work with it. For example, m2eclipse, as well as the above mentioned nexus. I don’t see much in the way of tooling support for ivy, for instance. m2eclipse makes it incredibly to make use of those internal libraries that you have developed. I also found it significantly useful for understanding how to author good POMs. I also can’t begin to state how wonderful I found the release plugin after using it for a while. It’s really critical to getting a good, consistent release process going. Like you, I haven’t used the branching functionality much. Development on shared code like that tends to happen in isolated spurts, so I’ve not found much need for a release branch. I do have one question though. With using story numbers as part of the snapshot revision, don’t you get quite a lot of merge conflicts? You’re right, we do get quite a lot of conflicts in the pom.xml files, but they tend to be easy to resolve. Merging a story branch into the master means that you’re removing the story name from the version number, and we keep story branches short-lived, so we don’t do a lot of merges back and forth between them. Good point about the tools support as well – that is an important thing for productivity. I’ve not used Eclipse much in the last 2 years, but IntelliJ IDEA has great Maven support built in as well. Excellent post! Love the well-documented pom.xml. Clarified how best to hold shared Maven configuration. Hi, I’ve noticed you use separate repositories for internal releases and snapshots. Doesn’t this prevent you from using “Remove Snapshots From Repository / remove if released” in Nexus as snapsot repository never knows about releases? Branch merge conflicts is also an annoying thing for us. We use mvn release:update-versions after almost every merge before committing. We are in fact using the ‘remove if released’ feature. I haven’t spent any serious time trying to figure out whether it works or not, but my interpretation of the Nexus documentation is that it should work even if you separate release and snapshot repositories: “This tells the task to ignore the above settings if an artifact with the same group/artifact/version is detected in a release repository”. A quick glance in our Nexus repo seems to bear that out as well – snapshots relating to released versions appear to be deleted for the one project I checked.